Jagannatha Puri, a town of 75,000, is one of the most important pilgrimage centers and one of the four holiest cities in India. These four cities are Badrinatha in the north, Dvaraka in the west, Ramesvaram in the south, and Puri in the east. Badrinarayan in Badrinatha was especially worshiped in Satya-yuga, Rama in Ramesvaram in Treta-yuga, Dvarakanatha in Dvaraka was especially worshiped in Dvapara-yuga, but Lord Jagannatha in Puri can be worshiped by everyone in Kali-yuga. In fact, the importance of Jagannatha Puri, sometimes called Purushottama-Ksetra, is explained in chapters 52 through 57 of the Uttarabhaga section of the Narada Purana. 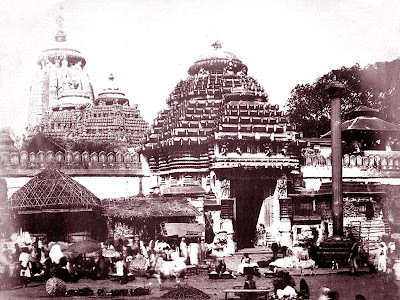 There we find it stated that simply by visiting Puri, which is rarely achieved except for those who have performed many pious acts, and by seeing the Deity of Jagannatha (Krishna), one can easily attain freedom from future births and reach the spiritual abode. 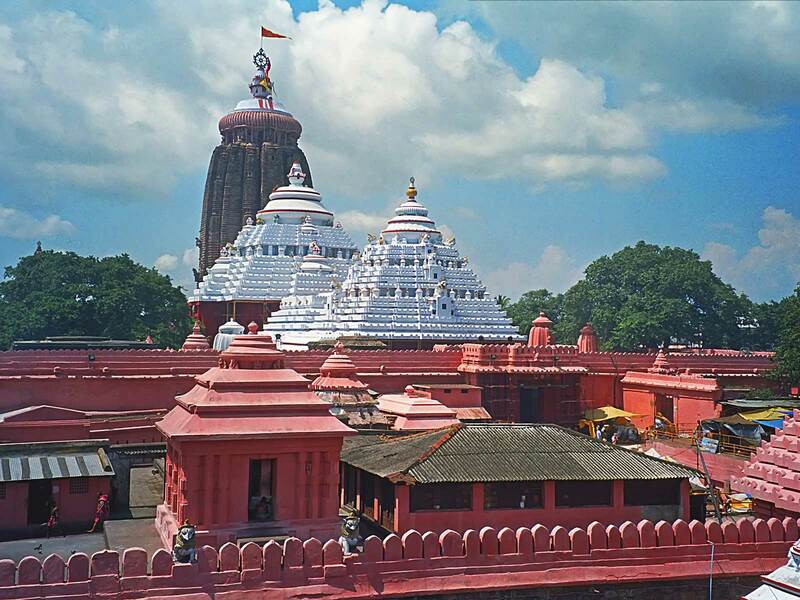 In the middle of this city is the large temple dedicated to Lord Krishna as Jagannatha, meaning "Lord of the Universe." From the Skanda Purana we get information that the original construction of the first Jagannatha temple was in Satya-yuga, millions of years ago. It is related that Lord Jagannatha told Maharaja Indradyumna that He first appeared in the Svayambhuva manvantara of the first part of Satya-yuga, on the full moon day, after being pleased by devotion. This is about 153 million years ago. Then Brahma installed the Deities in the temple. This appearance is celebrated by the Snana Purnima, or Snana-Yatra, which is the public bathing of Lord Jagannatha, His brother Balarama, and His sister Subhadra. The celebrated Ratha-Yatra festival is said to have started in the time of Svarochisha Manu, or the second manvantara period, and is predicted to continue until the end of the second half of Lord Brahma's lifetime. Even in the Ramayana by Valmiki Muni (Uttara Khanda 108.30) it is related that when Lord Rama was getting ready to leave this world he told Vibhishan, Ravana's younger brother, that in His absence he should worship Lord Jagannatha, the Lord of the Iksvaku dynasty. The Skanda Purana also fixes the date of the Ratha-Yatra festival, which should be celebrated on the second day of the bright fortnight if the month of Ashadha, a day called Pushyami Nakshatra by astrological calculations. The Padma Purana describes (as related in Sanatana Goswami's Dig Darshini Tika to his Brihad-Bhagavatamrita, 2.1.159) that in Purushottama-kshetra, or Jagannatha Puri, the supremely blissful Personality of Godhead pretends to be made of wood. In this way, although the Lord takes on what appears to be a material form, it is completely spiritual by the causeless mercy of the Lord for the conditioned souls who cannot perceive the transcendental domain. Lord Jagannath, the symbol of universal love and brotherhood is worshipped in the Temple alongwith Balabhadra, Subhadra,Sudarshan, Madhaba, Sridevi and Bhudevi on a Ratnabedi platform. The Deities of Lord Jagannath, Balabhadra, Subhadra and Chakra Sudarshan are made of margosa wood. Lord Balabhadra Lord Jagannath's elder brother, and Devi Subhadra is his younger sister. When one lunar month of Ashadha is followed by another lunar month of Aashadha, the deities change their bodies. This is known as Navakalebar or New Body Ceremony. Last four new body ceremonies of the Lords was celebrated in the year 1950 , 1969, 1977 and 1996. On such occasions Puri witnesses the largest crowd in her fold. 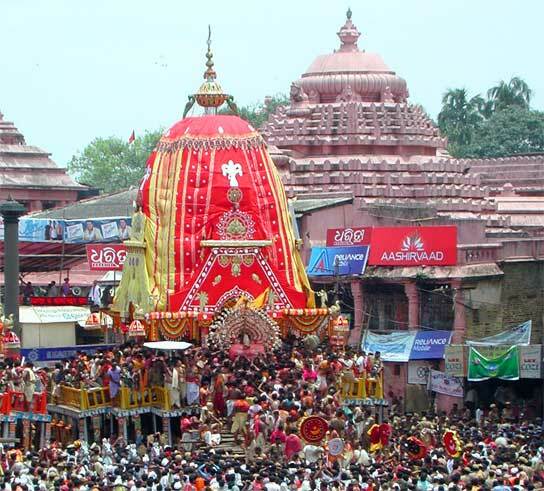 Jagannath Puri Rath Yatra parade is an awfully colorful festivity, in which people take part actively. The idols of God Jagannath and his brother Balabhadra and his sister Subhadra, enshrined in the Sri Mandira, are brought out and placed on their respective chariots in the Rath yatra. The main chariot is 14 meters high and 10 meters square with 16 wheels. The idols of Lord Jagannath, Lord Balabhadra and Goddess Subhadra are wearing the beautiful shiny clothes. These chariots are pulled by the Thousands devotees and the idols are taken to Gundicha Temple. The gods stay at this temple for seven days and then return to Sri Mandira, in a similar procession. 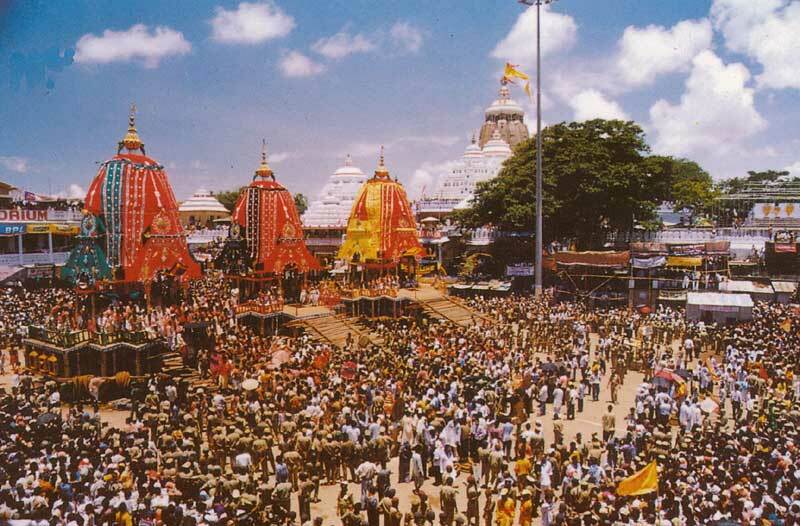 Jagannath Puri Rath Yatra is chariot journey of God Jagannath which observed in the month of Ashadh and is an event that celebrates the annual visit of the God to his birthplace. The Yatra is considered as a main part of festivities and ceremonies of each temple and is measured as a special and sacred event. In this festival chariots, elephants, trucks, motor vehicles, acrobats and gymnasts are colorfully decorated. And temples are decorated by beautiful designed and colorful flowers. Jagannatha's chariot is called Nandighosha, which is Yellow in color, 45 ft high and has 16 wheels, each one seven feet in diameter. About 4,200 devotees draw the chariot. Balabhadra's chariot is called Taladhvaja, which is blue in color and has 14 wheels. Subhadra's chariot is the smallest, with 12 wheels and is called Deviratha. The Legends behind the Yatra festival has been celebrated since ancient times. Some Hindus believe that Jagannatha is an incarnation of Vishnu. Since Vishnu has four arms, Balabhadra, Subhadra and Sudarshana represent Vishnu's four arms. Puri's Rath Yatra is a divine feat, an absolute climax of a year's devotion and prayer for devotees who throng this beach city for the grand event. For many days, visitors watch the progress of the constructions of the three giant cars. These heavy wooden pyramids on wheels are up to 15 meters high. The wheels are more than 2 meters in diameter. Touching the wheels in the course of the procession means salvation for most pilgrims. Hundreds of artisans are involved in the process. Carpenters, carvers and painters swarm over the rough frames and soon countless deities are eternalized in wood. The Orissa government supplies the wood for these massive structures. The building site, on the Grand Road, resembles a huge fairground during this time. Pulling the giant chariots is not an easy task. The police perform several test runs before the main day. The festival commemorates Krishna's journey from Gokul to Mathura. But that is just one part of the story. It also marks the day of Rig Veda, the day the oldest Veda was revealed. The central characters in this unique spectacle are the deities Jagannath and his brother and sister, Balabhadra and Subhadra. Long before the gods make an appearance, the Grand Road, which stretches for more than a mile from the Jagannath Temple to the Gundicha Mandir (the Garden House), is packed. The king of Puri, Dibyasingh Singh Dev, is present as the gods emerge from the temple. And no wonder, his ancestors first chanced on the Jagannath cult, when the Gonds, an indigenous minority, practiced it in the Orissa jungles. It is his honor to clean the chariots with sandalwood water and a golden broom. Around midday the gods are lodged safely in their vehicles. Household articles and personal effects of Jagannath and his siblings follow the deities on board their chariots. Each god takes his/her own toothbrush. Balabhadra's car is the first to be pulled. The giant chariot is loaded with temple priests. Pilgrims and temple workers jostle and fight for the ropes of Balabhadra's car. Devotees have been known to jump under the wheels of the chariots, to die in the god's sights. Priests smash coconuts against the wheels of the car, and then hand the broken, blessed shells to the pilgrims. Soon all three cars, floating in a vast sea of humanity are conveyed down the Grand Road, stopping and starting. The cars take an enormous effort to pull; they look unmaneuverable and once at good speed, are almost impossible to stop. When the cars reach the Garden House, the gods take a week-long break, before being reloaded onto the cars in a similar fashion and returned to the Jagannath Temple. Once the second leg of the procession is concluded, the gods are covered in gold, in a last frenzied ceremony before the cars are broken up and used for firewood inside the kitchens of the Jagannath temple.